Tuesday, November 29, 9:30 a.m.: Rochester MPCA office, 18 Wood Lake Drive S.E., Rochester, MN 55904 (free parking in office lot and on street). Tuesday, Nov. 29, 2:30 p.m.: Mankato MPCA office, 12 Civic Center Plaza, Suite 2165, Mankato, MN 56001 (parking for a fee in ramp and on street). This meeting will also be available via Web-ex with details posted later. Wednesday, Nov. 30, 9 a.m.: Marshall MPCA office, 504 Fairgrounds Road, Suite 200, Marshall, MN 56258 (free parking in lot across the street). Thursday, Dec. 8, 12:30 p.m.: Brainerd MPCA office, 7678 College Road, Suite 105, Baxter, MN 56425 (free parking available in office lot). This meeting will also be available by videoconference at the MPCA offices in Duluth and Detroit Lakes, as well as by Web-ex. A presentation in St. Paul has not been scheduled yet. Please email Pete Fastner of the MPCA (peter.fastner@state.mn.us) if you have further questions. The MPCA invites comments through Dec. 14 on a proposal to improve fish and vegetative habitat in the St. Louis River at 40th Avenue West in Duluth. 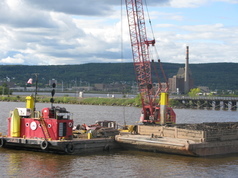 The project requires dredging about 350,000 cubic yards of clean sediment from the navigation channel and strategically placing it to restore 317 acres in an area affected by a century of industrial activity and shoreline alterations. This is a collaborative effort between the MPCA and Minnesota Department of Natural Resources. Project details are included in a draft Environmental Assessment Worksheet, which the MPCA will use to decide whether a more complete Environmental Impact Statement is needed. The worksheet covers site location details, nearby resources, and other environmental factors. These include land use, soils, water resources, existing sites with contamination, fish, wildlife, plant communities, sensitive ecological resources, historic properties, air and noise levels, and traffic. Comments on the worksheet, which must be in writing, are due by 4:30 p.m. on Dec. 14 to Patrice Jensen, MPCA, 520 Lafayette Road N., Saint Paul, MN 55155 or patrice.jensen@state.mn.us. The MPCA invites comments through Dec. 16 on a draft permit to address groundwater and surface water pollution from the tailings basin at U.S. Steel’s Minntac Iron Ore Operations near Mountain Iron in northern Minnesota. U.S. Steel mines, crushes, and processes iron-containing rock into taconite pellets at its Minntac facility. The crushed rock remaining after the iron is removed and the process water are disposed of in a large, aboveground impoundment called a tailings basin. This water and any precipitation that contacts the tailings are considered industrial wastewater, which is regulated by MPCA permits. Taconite processing requires a lot of water, and the basin serves as a reservoir for water used in the plant. The basin covers roughly 8,000 acres and is located in the Rainy River watershed and two sub-watersheds within the Rainy system: Sand River to the east of the basin and Dark River to the west. Water leaves the basin by seeping out the lower sides of the basin walls and through the bottom of the basin, impacting nearby streams and groundwater. Comments, which must be in writing, should go to: Erik Smith, MPCA, 520 Lafayette Rd. North,St. Paul, MN 55155 or erik.smith@state.mn.us. Comments must include a statement of your interest in the draft permit, the specific action you wish the MPCA to take, and reasons supporting your position. For more information, see the MPCA fact sheet on the draft permit. The MPCA recently approved the Watershed Restoration and Protection Strategies report for the Mississippi River-Winona watershed, including the Whitewater River, in southeastern Minnesota. An abundance of water, beautiful scenery, and widespread public areas make this watershed a popular destination for trout fishing, paddling, hiking, hunting, and other outdoor recreation. Whitewater State Park draws about 300,000 visitors annually. This area of Minnesota is vulnerable to pollution because of its karst landscape. In karst, only a thin layer of soil covers the porous bedrock underneath and allows pollutants on the land to easily reach groundwater used for drinking. 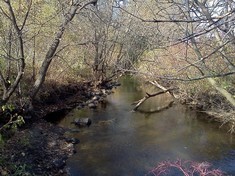 Many areas in this watershed provide high-quality habitat for fish and other aquatic life, and need protection. Strategies that would both help protect and restore streams throughout the watershed include planting cover crops, installing buffers along streams, installing grassed waterways, using contour farming, implementing water and sediment storage, and managing crop residue. The MPCA recently approved the Watershed Restoration and Protection Strategies (WRAPS) report for the Buffalo River watershed in northwestern Minnesota. This watershed, mostly used for agriculture, covers more than 1,100 square miles in portions of Clay, Becker, Wilkin and Otter Tail counties in western Minnesota. The poor water quality conditions reflect the intensely farmed landscape, human changes to hydrology, intensive drainage, and lack of buffers around lakes and streams. Restoration strategies will need to focus on reducing phosphorus, sediment, and bacteria through livestock management, nutrient management, wind breaks, buffers, and other best management practices. The Audubon Center of the North Woods in Sandstone is hosting Water/Ways, a traveling exhibit from the Smithsonian's Museum on Main Street program. The exhibit will run through Dec. 31 with a New Year’s Eve dinner and presentation on the final day. Visiting groups can book a tour and lesson. Hours for drop by visitors vary; please check the website. Water/Ways reveals the central nature of water on our lives by exploring how Americans use water, how water unites communities, how water affects every element of life, and how Americans care for our water and protect this valuable resource. As Governor Mark Dayton mentioned in his 2016 Water Summit speech, “We have critical water quality problems in Minnesota . . . we cannot ignore them. We have to face up to them and work together, to solve them.” Water/Ways addresses water resource issues while seeking active solutions to real water problems in the host communities and our state. Explore this collection of stories about water to learn more about the community in and around Sandstone. The Minnesota Association of Watershed Districts will hold its annual meeting Dec. 1-3 in Alexandria. Program topics include stormwater treatment, addressing increased flows in the Minnesota River, One Watershed One Plan, new approaches to TMDL studies, and updates to the Minnesota Public Drainage Manual. See details on the association website. Various programs of the MPCA will be represented at the trade show of the Minnesota Association of Soil and Water Conservation Districts convention Dec. 4-6. The main trade show occurs on Monday, Dec. 5. A new feature this year will occur Tuesday, Dec. 6, the "Conservation Information Fair" from 7:30 a.m. to noon. Businesses and agencies participating in the fair "will have the opportunity to meet with the award-winning landowners, farmers, sportsmen, and conservation leaders from around the state." The MPCA will be participating in both events. In the past, MPCA programs represented in the Monday trade show included feedots, construction stormwater, citizen monitoring, subsurface sewage treatment systems, nutrient reduction strategy, and Watershed Restoration and Protection Strategies. The convention program includes business meeting, awards, and a variety of concurrent education sessions. The Minnesota Association of Soil and Water Conservation Districts represents the 89 soil and water conservation districts of Minnesota. Canoe veteran and author Dave Lind will present his view of the Zumbro River, Thursday, Dec. 8, at 6:30 p.m. in Rochester. Using photos and maps, Lind will take the audience down the main stem from Zumbro Falls to the Mississippi River as well as travels on the North, Middle and South forks, a total of 182 miles of river canoeing and kayaking routes, including both routes covered by outfitters as well as many less traveled routes. Discover how the Zumbro has changed over the years and how the increase in recreational canoeing, kayaking, and fishing is changing how people view the river. This talk is part of the Zumbro Watershed Partnership’s “Water Ways” Speaker Series that takes place the second Thursday of each month at 6:30 p.m. at the Cascade Meadow Wetland and Environmental Science Center in Rochester. For more information, contact ZWP Education Coordinator Kevin Strauss at education@zumbrowatershed.org or at 507-993-3411.
pulling it all together into a work plan that could be used for a grant proposal. For more information contact Ann Lewandowski, WST Program Coordinator, University of Minnesota Water Resources Center, St. Paul, MN, 612-624-6765. The MPCA website will be under maintenance and offline starting Friday, Dec. 9 at 3 p.m. All web-based services will be unavailable until Monday Dec. 12. If you use the MPCA website, web-based applications or e-Services, these will be unavailable from Dec. 9-12. The MPCA recommends finishing any required business before Dec. 9. If you have questions, please contact public information officer Cathy Rofshus at the email or phone number below.